An announcement has been made that a second ship will be added to Bahamas Paradise Cruise Line’s West Palm Beach to Freeport, Bahamas, service. This will increase the getaway cruise departures up to daily service, with as many days stopover as one wants. If all goes to plan, the existing Grand Celebration will be joined by a renamed Costa neoClassica next spring. We take the opportunity to look back at some of the earlier cruise services that operated from Palm Beach. Meanwhile, P&O Cruises’ naming contest for its new 5,200-berth megaship, to enter service in 2020, has closed. And Uniworld have announced that it will convert an existing vessel into its latest S.S. Super Ship. On August 17, the Port of Palm Beach District Commission unanimously agreed to a ten-year agreement for the addition of a second cruise ship into the service between West Palm Beach and Freeport, Bahamas. The second ship, sailing presently as the 1,308-berth Costa neoClassica, will join the exisiting 1,496-berth Grand Celebration by next spring. Each ship wlll sail every other day on the 2-night cruise to Freeport and back, meaning daily departures from 2018. 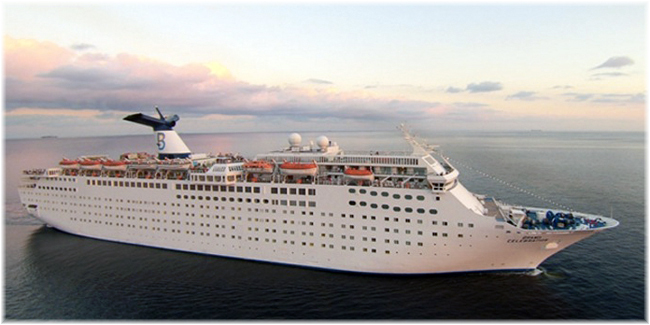 Bahamas Paradise Cruise Line has tentative plans to bring the NeoClassica from Greece in March. The ship, which was renovated in 2014, is scheduled to enter service in May. As well as holidaymakers going to the Bahamas, these cruises have proved popular with Bahamians coming to Palm Beach to shop. The cruise line estimates the Bahamian passengers shopping spend at $4.5 million a year. The port projects it will receive between $54.3 million and $62.9 million in net income from the two ships over ten years, depending on number of passengers handled. The annual capacity of the two ships is forecast at close to 1.3 million passengers per year. Kevin Sheehan Sr, former ceo of Norwegian Cruise Line, and his family acquired majority ownership of Bahamas Paradise Cruise Line in December. Sheehan, who serves as chairman, said he acquired the line from previous owners who were largely involved in timeshare management. The getaway two-night cruise to Freeport fills a unique niche and packages including hotel are planned for up to 7 days, including stays in both Palm Beach and Freeport. With Miami and Port Everglades both directly south, cruise ships have not made a home of Palm Beach. In the past the available draft has also limited cruise ship operations. While the port or un by the Port of Palm Beach it is actually located in what is generally known as West Palm Beach, across Lake Worth and on the Intra-Coastal Waterway. While early steamers to Nassau did leave from a railway pier located in Palm Beach the vast majority of port operatons here have taken place in West Palm Beach. The first cruise line to come to Palm Beach was the Clarke Steamship Company, which in January 1927 began offering weekly cruises from both Palm Beach and Miami to Nassau and Havana using their 142-berth New Northland, which had been delivered by the famous Swan Hunter shipyard in Newcastle the previous year. Palm Beach thus shares the record with Miami for having hosted the first weekly cruises to be offered from a Florida port. 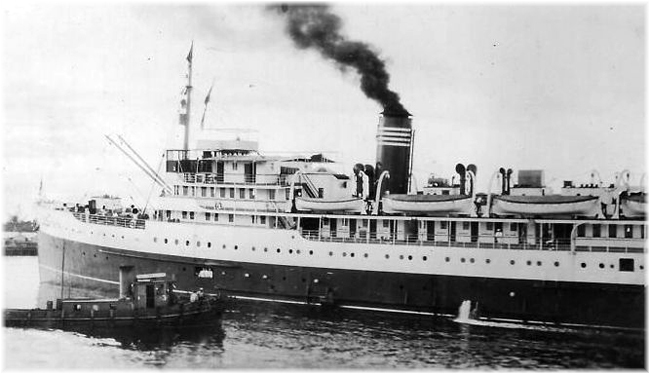 In 1928, however, the New Northland was chartered to Munson Steamship Lines, who ran her on the regular Miami-Nassau service, with no more calls at Palm Beach. Clarke Steamship came back in December 1945, however, with the 46-berth North Gaspé, followed in January 1947 by the 76-berth North Shore, again cruising to Nassau and Havana, but now on charter to the West India Fruit & Steamship Company of West Palm Beach. The cruise service ended however when West India Fruit took delivery of three railcar ferries that it put into operation between West Palm Beach and Havana. These newly-acquired ferries carried twelve passengers each. The longest-lasting Palm Each operation in more recent years was Crown Cruise Line, which offered 7-night cruises from the port. 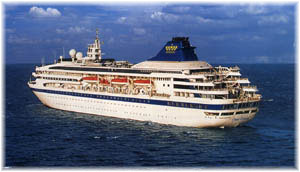 Crown Cruise Line was a small, upmarket cruise operator, founded by Oddmund Grundstad and based in Boca Raton. Grundstad had previously been active in the day cruise business operating a dayboat called the Viking Princess.. In 1988, Crown began offering overnight cruises from West Palm Beach using the 500-berth Crown del Mar, operating 2-night cruises to the Bahamas and 5-night Western Caribbean itineraries. This ship was the former Trasmediterranea ferry Las Palmas de Gran Canaria. 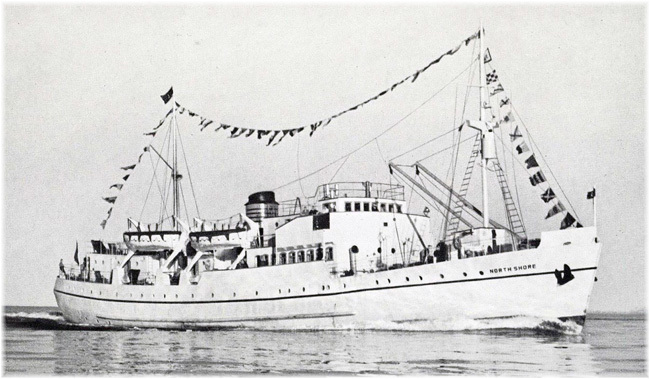 When the Crown del Mar entered service, Crown ordered a new ship from Union Naval de Levante in Valencia, who had done the conversion of the Crown del Mar. The 530-berth Crown Monarch, delivered in 1990, offered, 7-night cruises from Palm Beach to Key West, Grand Cayman, Ocho Rios and Labadee Shores, Crown`s private beach in Haiti. And in September and October, it was planned that she would perform three 7-night cruises to Canada and a two-week cruise from New York to the Caribbean. The Crown Monarch ultimately replaced the Crown del Mar. A new 45,000 square foot cruise terminal was also constructed for use by Crown Cruise Line at Palm Beach, opening in 1990. Two more ships followed but were mainly employed elsewhere. These were the 19,046-ton 929-berth Crown Jewel in 1992 and sister ship Crown Dynasty in 1993. These ships were completed for Finnish-Swedish owner Effjohn, which owned Commodore Cruise Line and bought out Crown Cruise Line in July 1991. The three-ship operation was not successful however and Effjohn attempted to salvage the venture by cooperating with Cunard Line, which agreed to a ten-year charter for all three ships, starting in 1993. Before long, the ships no longer sailed from Palm Beach and the mainstay Crown Monarch was sold east as a gambling ship. Several years later, in March 2010, a new company called Celebration Cruise Line introduced the 1,200-berth Bahamas Celebration, offering two-day cruises from West Palm Beach. A former European night ferry, she had started operating 2- and 3-night cruises from Port Everglades to Nassau in March 2009 but soon moved her base to West Palm Palm Beach, switching the line’s destination from Nassau to Freeport at the same time. In October 2014, the Bahamas Celebration hit a submerged object when leaving Freeport and had to be taken out of service. Celebration Cruise Line then eventually evolved into today’s Bahama Paradise Cruise Line, with some of the same management. The new line then introduced the Grand Celebration in February 2015. Operators of small ships such as Ponant and Blount Small Ship Adventures have also been Palm Beach customers. Introducing the latest addition to the P&O Cruises fleet, the year 2020 will put P&O Cruises into the history books again, with the introduction of Britain’s biggest ever cruise ship. The new vessel will be a near sister to the ships that Meyer Turku is now building for AIDA Cruises and Costa Cruises, thus giving Carnival Corp & plc a similar platform in its British, German and Mediterranean markets. Carnival Cruise Line will introduce a similar version to the American market. At 180,000 tons, the 5,200-berth P&O ship, whose naming contest closed on July 31, will offer more choice of accommodation, more places to dine, more spaces to relax and more entertainment than any other UK cruise ship. The winner of P&O’s naming competition will not take place until next year, but the line will be issuing updates on its newbuilding from time to time on its website and social media. Included in the new offer will be more than fifteen places to eat to suit all appetites and occasions including eight speciality restaurants, more than ten places to enjoy a drink and take in sea views, sixteen whirlpools, four swimming pools (three outside and one inside), eight places to have breakfast, four places to take afternoon tea, eight places to enjoy fresh coffee, plenty of entertainment venues from the theatre to venues for adults only. Meyer Werft, the world-leading cruise ship builder. They have built ships for AIDA Cruises, Royal Caribbean International, Disney Cruise Line, Holland America Line, Norwegian Cruise Line, Celebrity Cruise, Saga and Dream Cruises. Jestico + Wiles of London, award-winning residential and commercial architects whose work includes the Aquashard (London), Yas Hotel (Abu Dhabi) and W Hotel (London). Richmond International of Londo, hotel architecture and interior experts. 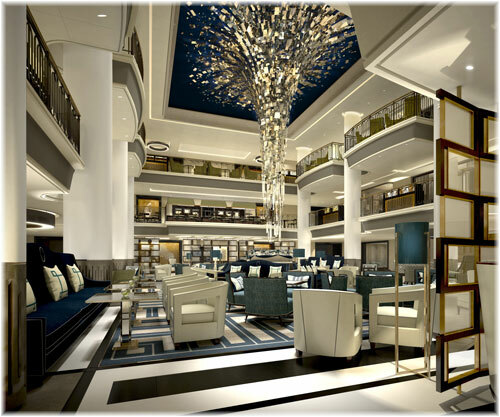 Richmond International first worked on the Britannia and their luxury hotel portfolio includes The Langham Hotel in London and Chicago, The Beaumont in London, The Four Seasons in Moscow and the Sandy Lane Hotel in Barbados. Partner Ship Design of Hamburg, experienced in maritime architecture and specialists in on board guest experience and flow. Projects include AIDA Cruises, Costa Cruises, P&O Cruises and Carnival Cruise Line. Uniworld will add a fifth S.S. Super Ship to its river cruise fleet by revamping an exisiting vessel for the 2018 season. Built in 2009, the River Beatrice will receive a bow-to-stern renovation, with a new grand staircase, private dining area to replace the Captain’s Lounge and Library, and three new suites — two 375 sq ft Royal Suites and an Owner’s Suite. The 156-berth ship’s twelve existing suites will be refreshed, and connecting rooms will be added for families travelling together. The design team from parent company Red Carnation Hotels will oversee redesign of the public spaces and rooms. High-tech amenities will also be added. S.S. Beatrice’s maiden voyage will take place on April 4, 2018, coinciding with the official launch of the company’s new brand U by Uniworld, the first river cruise line aimed at travellers aged 21 to 45. The line is taking a similar tack with U by Uniworld by refurbing existing vessels River Ambassador and River Baroness into The A and The B, names that remind one of the Confederate blockade runners Letter A and Letter B during the US Civil War. 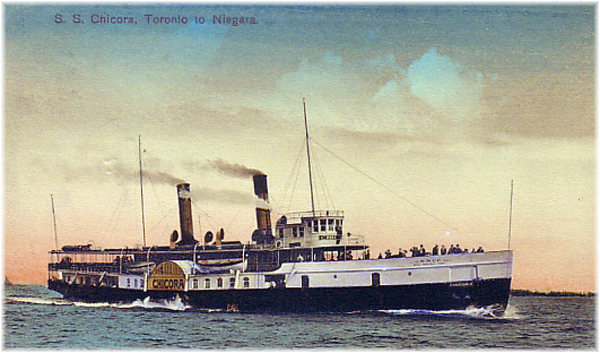 The Letter B (also rendered Let Her Be) became the Niagara Navigation Company’s Toronto to Niagara steamer Chicora in 1878, lasting until 1913.